Loaded E-Liquid Review (New Flavors!) - Daily Vaping Deals & The Best Vape Product Reviews at Vaping Cheap! In this e-juice review, we’ll be covering the two newest flavors from the Loaded E-Liquid line, Melon Milkshake and Apple Fritter. Loaded E-Liquid is definitely one of the more popular e-juice brands on the market, offering affordable yet premium quality vape juice. Just like their other flavors, these are available in 120ml glass bottles only, and are offered in nicotine strengths 0mg, 3mg and 6mg. In addition, both of these flavors are high VG (70VG/30PG), so they’ll vape great in atomizers such as RDAs, sub ohm tanks, RTAs and more. Before getting any further into this review, we’d like to thank EJuice Plug for sending these two flavors our way for the purposes of this review. We will provide you with our overall thoughts about these flavors and let you know whether or not we recommend them! Remember, taste is subjective, so what we may like you may dislike and what you like we may dislike. We will first go over the specific mods and atomizers used to test each of these flavors and then continue on to the review of Loaded E-Liquid’s newest flavors! 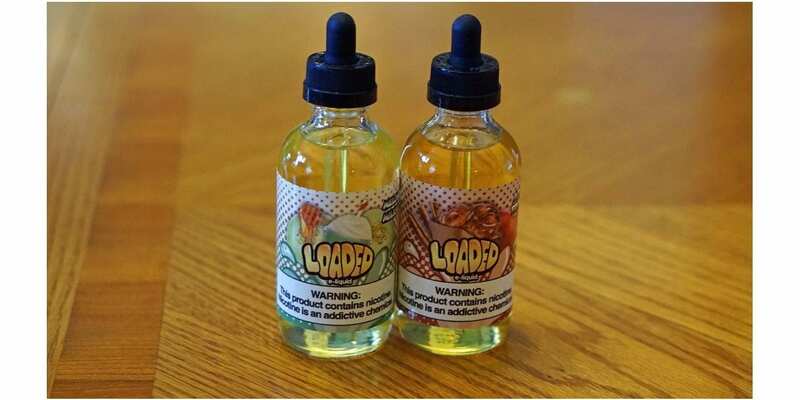 Click Here to Check Out Loaded E-Liquid! Flavor Description: Apple fritter consists of soft caramelized apple bites, heavenly golden brown crust, and freshly grounded cinnamon. Bon Appetit! Apple bakery or dessert flavors are quite popular, but I must say this one is bit different from the others reviewed in the past. The first time you take a vape of this e-liquid, the first flavor note you’ll notice is the fresh green apple. It’s authentic tasting, which is definitely a good thing for these types of flavors. On the inhale, you get the fresh apple, but with hints of caramel. On the exhale, you get the same tasty fresh apple note with caramel and as you exhale, out comes the cinnamon. The throat hit on this one is smooth just like the other Loaded E-Liquid flavors released. I’m glad to report that the cinnamon in this one isn’t overpowering whatsoever. It’s more of a background note, and compliments the apple and caramel. However, there is a bakery flavor as well you’ll notice on the exhale, which is what I’d assume is the golden brown crust. This flavor vapes better in my opinion at higher wattages as with a lot of bakery and dessert flavors. There is a decent amount of sweetness as well with Apple Fritter, but not too much where it’s just too much. The most noticeable flavor throughout the entire vape experience is the apple, then comes the caramel, cinnamon and bakery note. Overall, although I’m not the biggest fan of apple vapes, I must say I did enjoy Apple Fritter by Loaded E-Liquid. It’s well balanced, sweet enough to satisfy my sweet tooth, and vapes great in both tanks and drippers. If you enjoy apple and bakery flavors, then I would definitely recommend trying this one, you won’t be disappointed. Flavor Description: Melon Milkshake E-juice is a silky smooth e-liquid with incredible flavor. Refreshing melons blended into a rich milkshake with a hint of honey is a true crowd pleaser. Don’t sleep on Melon Milkshake! Now, I will say I’m a big fan of honeydew and cream flavors, so I was excited when Loaded E-Liquid announced Melon Milkshake. There are quite a few melon and cream flavors out there on the market, but once again, these guys did something different. On the inhale, you taste an incredibly creamy honeydew melon. On the exhale, you get the same, but at the very end of the exhale is where the honey kicks in. Honestly, the honey took me off guard at first, and it did take some time to get used to it as I don’t vape much or any flavors with honey flavoring. After you take a vape, the honey flavor does linger, and you can taste it for a bit then it goes away. This was one of those flavors where the more I vaped it, the more I enjoyed it. The inhale and exhale is very creamy, and is to be expected since it’s a “milkshake” flavor. It does taste like an actual milkshake, and it does vape great at both higher and lower wattages. The throat hit on this one is also very smooth with no burning or stinging whatsoever. All in all, Loaded E-Liquid Melon Milkshake is an excellent addition to the lineup. It’s probably one of the most creamiest flavors I’ve tried, and is considered an all day vape. If you’re looking for a good creamy honeydew flavor, but want something just a bit different, then this flavor is highly recommended. In conclusion, these two new flavors in the Loaded E-Liquid line are excellent. Ever since their first release (Glazed Donut), we’ve been huge fans of them, and they certainly didn’t let us down with Melon Milkshake and Apple Fritter. Both of these flavors vape great in the setups used to test them, and the throat hit was silky smooth. The vapor production was also very good and is pretty much what you’d expected with a 70VG/30PG blend. My personal favorite between these two has to go to Melon Milkshake, it’s seriously that good. That little hint of honey, and the creaminess is what sets this flavor apart from the competition. If you’re a fan of Loaded E-Liquid or simply looking for some quality e-juice at a great price, then we highly recommend these two new flavors. At only $17.99 for a 120ml bottle, we think it’s an excellent deal.